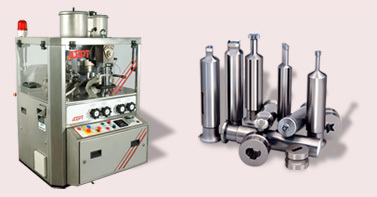 Adept is one of the leading Manufacturer of Tablet Presses & Tablet Compression Tools in India. Adept has been manufacturing Punches and Dies for over 40 years. Today it's the most reputed manufacturer of Tablet Tooling in India, a result of its unflinching commitment to quality since inception. Adept can supply Tablet Toolings for any make of Tablet Press including Fette, Korsch, Kilian, Manesty, Courtoy, IMA, Hata, Kikusui, Stokes, Ronchi, JCMCO.